Under Dr. A.S. Piggott, manufactured medicine for Confederacy, 1863-65. Remains are 2 mi. S.
In the summer of 1863 construction began on a Confederate medical laboratory in northern Lincoln County. Confederate authorities had authorized Surgeon Aaron Snowden Piggott to develop a facility for the production of indigenous medical supplies in response to the effectiveness of the Union blockade in keeping such materials from entering the Confederate states. A. S. Piggott, born in 1822 in Baltimore, was a physician as well as a chemist and geologist. A prolific author, Piggott’s work on medicine, chemistry, dentistry, and literature was widely published in the years prior to the Civil War. He had traveled extensively from his Baltimore home to North Carolina and Tennessee before 1861 studying the region’s geology. When Union troops occupied Baltimore in 1861, Piggott fled to Richmond and accepted a civilian position working with the Confederate Ordnance Bureau. In this capacity he traveled the South studying mining capabilities in North Carolina, Georgia, and Alabama. In 1862, the Confederate Medical Department offered him a surgeon’s commission in the army, and authorized him to build a medical facility. 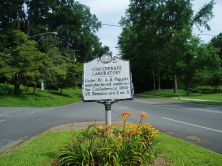 The reason Piggott chose Lincolnton for the site is unknown; however, by April 1863 construction had begun on property along South Fork Creek. The institute opened in late 1863, although construction continued late into the war. Piggott worked closely with the Confederate Navy Yard at Charlotte, and received equipment from the North Carolina Military Institute in the same city. 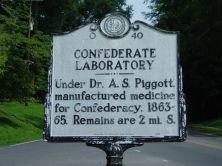 Piggott’s and his laboratory were captured by Union forces on April 27, 1865. Piggott received a parole on July 24, and returned home. He resumed his prewar activities, and became a professor of chemistry at the Baltimore College of Dental Surgery. He died on February 12, 1869 from a stroke. His grandson, Charles Snowden Piggott, who died in 1973, is considered one of the founding fathers of ocean-bottom marine research. The Confederate Laboratory building stood until 1886, when most of it was demolished to make room for the Laboratory Cotton Mill. Today the site is little more than ruins and a foundation.